When you enter Savage Umbrella’s SPACE where AfterWind currently lives, don’t settle for the first seat you see in front of you. It was only after I sat down that I took in the fact that the audience surrounds the central playing space of the AfterWind set designed by Herwig. In addition, each corner of the theater space on the perimeter holds a different shrouded installation. Each is revealed in time. Depending on where you’re sitting, you get a different perspective. Nothing is lost - the performers skillfully play to all sides of the space at all times - you’re just looking at things from another angle. AfterWind is so brief (only about an hour) and so immersive, it probably warrants repeated viewings. There’s a whole lot going on here. AfterWind sets itself the daunting task of imagining the unimaginable. AfterWind takes place in the moments after a bomb goes off. Potential audience members could be forgiven for thinking, Why would I want to sit through that? Given everything that’s been wrenching news coverage this way and that, with one traumatic event after another lately, subjecting one’s self willingly to an artist trying to unpack the details of such an incident doesn’t sound much like “entertainment.” But AfterWind takes a step back from documentary-style realism and focuses not on the incident itself, but on the humanity of those involved in its aftermath. There is no blood. There is no screaming. In fact there’s hardly any dialogue at all, and nothing you’d consider an actual back and forth discussion. 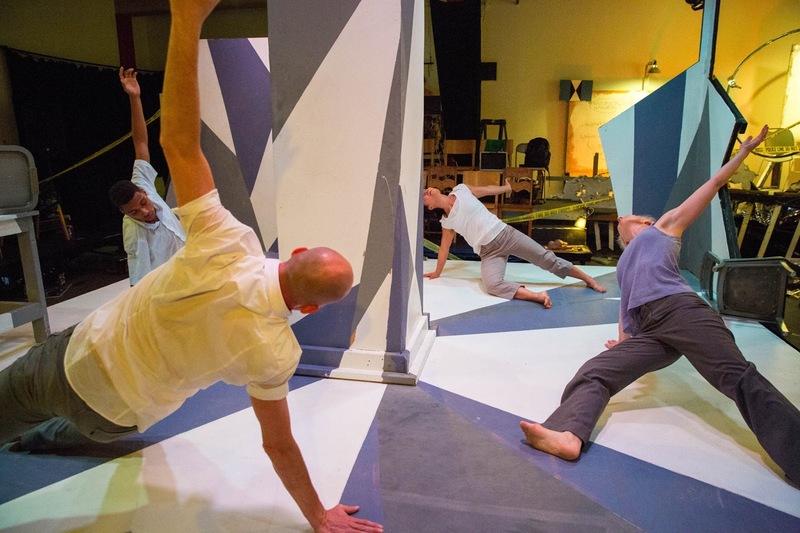 AfterWind focuses instead on stage pictures, much of the time pictures of human movement abstracted and slowed down to the point of near immobility. Every detail here matters. Ilse and her principal dancers - Kaori Kenmotsu, Jesse Neumann Peterson, and Darrius Strong - do such precise, controlled work that I marveled anew at the things the human body can do moving through space. At the same time, they are so often silent that even a repeated word or phrase uttered in a whisper seams explosive and makes you lean in. A brief prologue, which also includes the contributions of Robert Borman, Misty Brehmer, Alys Ayumi Ogura, and Lori Mercil, helps establish the ordinary world that’s about to be turned upside down. Scenes from a restaurant, scenes from an office. Craig Harris’ sound design (or, as it’s probably more correctly described in the program, a sound composition) kicks in from the very first moment. The audience and performers are awash in sound from beginning to end. At first with a cacophony of speaking voices blending together, accompanied by an underlying track of common sounds associated with such indoor environments. When the lights (designed by Paul Epton) suddenly shift and an echoing boom suffuses the space, the human voices and normal sounds cut out, replaced by an almost otherworldly soundscape. At this point, Paul Herwig, who until then has been trapped in a ramshackle booth lit from within, labeled as “Death Anxiety,” breaks out and joins the action. He rips the sides off the remnants of the building surrounding the survivors, wood and pieces of foil fluttering everywhere to the ground. One by one he reveals the installations, all manifestations of destruction, death and fear - all of which have to be seen to be believed. One by one he interacts with the remains of a regular human day now given a strange, unnatural context - a briefcase, a carry-on bag, a cell phone. He channels the final messages, oddly soothing in some cases, cut off abruptly in most cases. Loved ones calling from inside the scenes of disaster, saying what will be their final goodbyes. Herwig wanders the perimeter of the central space, twitching, in a stained shirt, his face covered in grey reminiscent of the ash-covered people wandering the periphery of the fall of the Twin Towers in New York, and many other more recent bomb blasts. Herwig also tellingly echoes words of political figures in our own time, as well as the fascists of the past. Their words blend together a little too easily for comfort. Meanwhile inside the damaged building, the four dancers struggle to breathe, to escape, to help one another, to live, and to go with some measure of grace when escape and rescue are no longer possible. They interact with the fallen office furniture trapped in the space with them. They also turn to their fellow dancers to console and even carry one another. To say it’s a comforting piece isn’t quite right. No one wants to hear that final breath. No one wants to see the lights go out. But at the same time, in a weird way, it’s not just horrifying but also calming seeing human beings in this situation, struggling mightily to live despite the odds. It makes a dark place, and dark times, a little less dark. Something I didn’t think was possible.